Sunday May 13th 2018 at The Copper Door in Santa Ana CA. MUSE is more than a Burlesque Show it’s an Art and Burlesque Experience! Our Mother’s Day Edition is Sunday, May 13th. As a prominant feature in the Santa Ana Artist’s Village every month we will feature a local artist’s work on stage and the absolute best in Burlesque and Variety. You can find us at The Copper Door every second Sunday. Perfect for a date night, girls night, guys night, bachelor/bachelorette party, or any special occasion! Come early for dinner and drinks! Bring your mom, wife, sister, grandma…. Let’s celebrate! 9:30 – Afterparty, performer meet and greet, dance party! 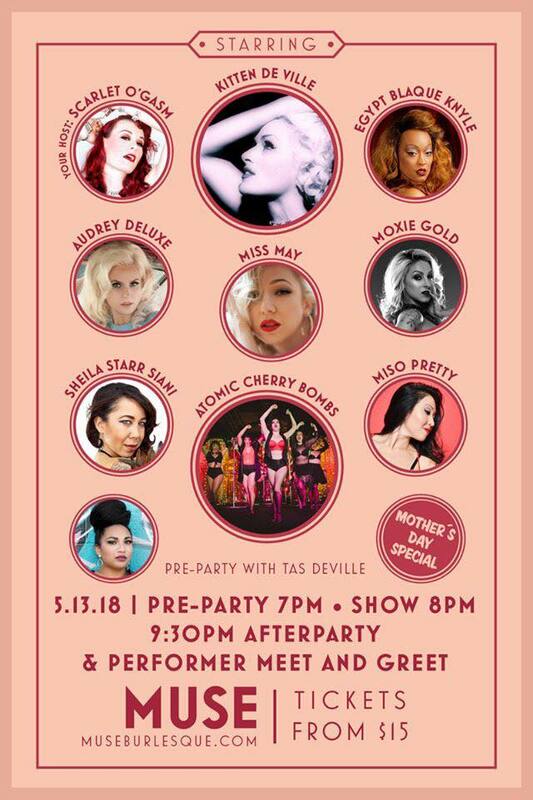 Starring an All Mom Burlesque Cast!